There’s a lot of information online, in parenting books, and elsewhere about the right way to discipline kids, but what’s the right way to praise them? Meting out praise can be tricky. 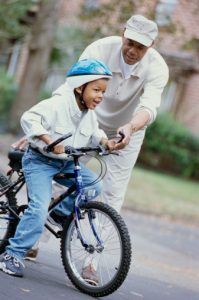 Check out these guidelines to ensure you praise your child in a way that nurtures their developing talents. Parenting experts agree that you should praise your child for the effort they put in as opposed to the end result. If your child is naturally good at math and doesn’t need to study much for tests, you may want to hold off on showering them with math-related compliments. Instead, encourage them when they tackle the subjects they find challenging. This promotes hard work and lets your child know it’s okay to leave their comfort zone and try things that don’t come naturally. Be as specific when as you can when complimenting your child. If you see them working on their layups before a big basketball game, compliment them on layups after the game – better yet, let them know exactly why their layups were looking so good, and in what ways their layups have improved since last week. Vague compliments can leave your child confused about what exactly they did that warrants praise. Highly specific complements let kids know you were really watching, sound more sincere, and help your child identify their unique skills. Whatever you do, don’t praise kids only for succeeding. Praising kids for trying and failing is important because sticking with things is a sure way to be successful. Anything from a new hobby to tying their shoes for the first time can be a chance to praise them for taking on something new. This will help them develop both perseverance and open-mindedness. When it comes to rewarding a job well done, avoid giving a material reward, especially money. It’s important for kids to understand that not all work yields a tangible reward. Instead, spend some quality time with your child eating ice cream, doing something fun, or just unwinding together. Let them develop personal pride in what they accomplish – that’s a quality that will stay with them forever.